The BMA’s new Interim guidance would enable doctors to dehydrate and sedate to death large numbers of non-imminently dying patients with brain injury, dementia, stroke, Parkinson’s, permanent vegetative state (PVS) and minimally conscious state (MCS) . The only two circumstances when clincally-assisted nutrition and hydration (CANH) is provided are if there is a decision by an authorised health and welfare attorney or following a clinician-led best interest process which supports the use of CANH. The categories exclude those who are not considered to be imminently dying unless CANH is withdrawn or withheld. All the categories of patients lack mental capacity to make decisions for themselves so that the guidance is concerned with the circumstances CANH can be withheld or withdrawn in order to bring to an end the life of the patient. The Nurse’s Code (NMC 2015) expects nurses to do no harm, conduct holistic needs assessments, be evidence-based in their practice and act as an advocate for the vulnerable. • One in five people with severe brain injury from trauma will recover to the point that they can live at home and care for themselves without help (Neurology August 2018). We believe the new BMA guidance fails adequately to recognise the complexity and difficulty of diagnosis and prognosis, removes safeguards that, for all its shortcomings, the practice of referral to the Court of Protection provided. The BMA proposals will enable euthanasia ‘by stealth’. Dr Shipman’s patients were murdered en masse and Dr Barton’s patients (so very many of whom died after being prescribed completely inappropriate opioid doses at Gosport Memorial hospital) did not, it seems, linger for days and weeks suffering the effects of starvation and dehydration which is a very cruel and unethical way to inflict death on anyone. Condemned prisoners are not expected to suffer where execution is legal and the ethics in such situations are being carefully considered these days. How can innocent patients with conditions with or without potential for recovery become victim blamed for surviving inconveniently for those (family members and even health professionals) who may have at best a defeatist attitude to rehabilitation and at worse a deadly agenda where finance may, of course, be a lurking factor? We have seen Eugenic ideology before. The Guidance appears to have no regard for truth, and it is chilling to instruct doctors to basically falsify the death certificate, recording the death as due to the underlying condition (from which a patient would not have died in the time-frame) rather than as a result of dehydration, starvation and sedation. Ethically-minded Coroners, knowing of such ‘guidance’ in medical deception will not accept falsified death certification, being mindful of not so distant European history. Ideologies are dangerous, particularly for the most vulnerable people who require most protection. (Clairmont 2016)The panel members of the Liverpool Care Pathway (Neuberger Review, More Care, less Pathway,) which had resulted in many terrible deaths, recommended the following:Specialist Services, Professional Associations and the Royal Colleges should hold and evaluate: Education, Training and Audit programmes. The aim of this recommendation was to teach health care professionals how to discuss and decide with patients, relatives and carers, the management of hydration needs at the end of life. Equally important, surely, in the name of compassion and humanity is true care for people who are not dying? A non- defeatist, compassionate approach to their possible recovery is needed. The Supreme Court Ruling in July 2018 over the case of ‘Y’ is curiously-timed to coincide with this guidance and needs to be over ruled. The education that the Neuberger important Inquiry recommended, cannot be supplanted by BMA guidance. Numerous submissions to the Liverpool Care Pathway Review from relatives and carers were critical of the common occurrence of fluid and nutritional needs being disregarded. The BMA guidance has naturally to be interim and open to wide consultation, in line with the human rights of all, patients, relatives and professionals. This BMA guidance if approved, will not stop health professionals’ right to conscientious objection, which will be exercised, in line with the expectations of nurses’ and doctors’ professional codes and their own regard for truth, true ethics and humanity. USA : New guidelines seek to address misdiagnosis of disorders of consciousnes. About four in 10 people who are thought to be unconscious are actually aware, according to new clinical guidelines for disorders of consciousness published in the journal Neurology. The article in Neurology, August, 2018, notes that, while the prognosis of patients with this condition differs greatly, some will eventually be able to function on their own and some will be able to go back to work. According to the guideline, approximately one in five people with severe brain injury from trauma will recover to the point that they can live at home and care for themselves without help. The guidelines, which outline best practice for managing patients in vegetative and minimally conscious states, are the product of an extensive consultation process with members of three speciality societies — the American Academy of Neurology (AAN), American Congress of Rehabilitation Medicine and the National Institute on Disability, Independent Living, and Rehabilitation Research. A fourth investigation is intended on Dr Barton’s patients’ deaths.They had usually been transferred from an acute hospital where they had been admitted for major illness or surgery. They needed more support than could have been provided in a nursing home.In some cases the aim of transfer to Gosport was for long-term care, as in patients with terminal cancer.Others, however, were there for rehabilitation following a stroke or fractured hip.When people die from a fracture, the cause of death should be recorded as “accidental” and accidental death is reported to a coroner.Dr Barton, however, recorded fracture-related deaths as stemming from bronchopneumonia, meaning the coroner was not informed. Any unusually high post-fracture death rate would therefore have passed unnoticed. June 2018 – Noel Conway loses his appeal to be allowed Assisted Suicide. It appears this is not to be considered as a human right. Advocates for Assisted Suicide will no doubt see the Gosport tragedy as a rare occurrence and redouble efforts, as usual, for a change in the law. Scientist,Dr David Goodall, at the great age of 104, who suffered no serious illness, but was tired of living with ‘reduced abilities’, travelled to Switzerland to end his life as he desired. Requests for assisted death usually arise from a person who is depressed, or whose symptoms are not controlled, and/or are fearful of what is before them, like abandonment or increasingly – a fear of being a burden. No one should overlook the findings of audits in countries and states where Assisted Suicide is legal that, ‘fear of being a burden’ underlies many people’s request for assisted suicide, rather than pain. Many of these patients have never been assessed by a psychiatrist for treatable, clinical depression. The Nursing and Midwifery Council (NMC), in their Care Booklet, stress that nurses must promote dignity and self-worth. This involves showing empathy and encouragement. For patients or their relatives to feel that the patient would be better off dead, does not promote self-worth and many will equate dignity with death and killing will become an option.The Nursing and Midwifery Council’s Code of professional Conduct (2015), states that nurses must make the care of the patient their first concern. If symptoms are present but are not being not relieved and fears not addressed, by referrals to the appropriate members of the Multidisciplinary team for their specific expertise, nurses are not meeting the holistic needs of the patient. act in partnership with those receiving care, helping them to access relevant health and social care, information and support when they need it. In the practical circumstances, however, in which staff caring for patients feel under pressure, and experience themselves as having very little time, it is often difficult to provide one thing – time, for the patient, that makes him or her feel cared for. The evidence in countries where assisted suicide is legalised, is that there is erosion to the point of destruction of effective Palliative Care and terrible abuse of the law. Moreover, existing extensions of the law in some countries for non- physical or psychological reasons for requesting death is a damning indictment of a society which views death as a commodity and consumer right and where ‘safeguards’ become merely obstacles to be overcome. Thousands of elderly people in Belgium have been killed by their doctors under the country’s euthanasia law, despite them not giving permission, a new report claims. The study published by the Journal of Medical Ethics said that many pensioners are being euthanized by their GPs in Belgium, even though they had never expressed a desire to die unnaturally. “The Belgian population should be aware of the present situation and know that if their lives may come to the point where physicians think they are not worth living, in the absence of specific living wills advising physicians what to do then, they might be put to death,” said report author Raphael Cohen-Almagor of Hull University. The report claimed that around one in sixty deaths that happened under GP care, involved someone who had never requested euthanasia. Research also showed more than half of the patients killed without giving their consent were over the age of eighty, while two thirds of them were in hospital but not suffering from terminal illness. Christian charity CARE said the report was an example of why assisted dying (suicide) was a dangerous precedent. It said the findings were a “serious warning of the consequences of following the same path as countries like Belgium”. CEO Nola Leach said: “I hope MPs pay close attention to this stark and very serious report, the contents of which is frightening and disturbing – “It is clear a real culture of euthanasia has developed in Belgium in the thirteen years since assisted suicide was legalised”. The doctor’s supposed role in this proposal for a change in the law, would inevitably be devolved to nurses as have so many other roles been delegated to nurses over time. 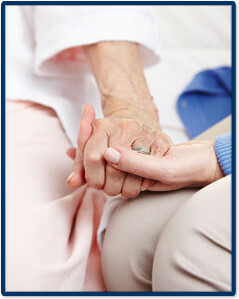 Nurses are trained to provide truly compassionate and dignified care. This means holistic, compassionate care delivered by nurses trained to promote life and its quality, rather than to become agents of the state by agreeing to participate in assisted suicide for their patients. Parliamentarians themselves need to stick to the public safety angle. Some may agree in principle that we should permit others to help people to die, but there is no way around the argument that allowing the practice would put vulnerable people at risk as Belgium, Holland and Oregon have shown. Parliament and Government have a duty to protect the vulnerable, not put them in jeopardy. We must be resolute in the face of insults and jeering from those want to see our society taken back to a genuinely retrograde civil society where a ‘winner takes all’ culture, defines the way we see the vulnerable. Hard cases make bad laws. Any change in the current law would give free rein to eugenics, and economically-driven or defeatist health professionals and others who would act with impunity Even in a free, democratic society there are limits to human freedom and the law must not be changed to accommodate the wishes of a small number of sadly desperate and determined people, who wish to impose their goals on all. Hard cases make for bad laws Any change in the current law would give free rein to eugenics and economically-driven or defeatist health professionals and others, who could act with impunity. Opposition to liberalising the law on assisted suicide is due to the risk such changes would pose to public safety and especially the most vulnerable in society. Pope Francis speaks on end of life issues. (Acknowledgement to BioEdge) “Care” vs “overzealous treatment”: Pope Francis has advised doctors to avoid “overzealous treatment” of patients at the end of life, saying that “burdensome” treatment may not be in the bests interests of the person. The term ‘treatment’ however, needs careful consideration and understanding of how it is defined under UK law. Within the UK Mental Capacity Act (2005) the term ‘treatment’ is defined as: ‘any diagnostic or other procedure’ This is an extraordinarily wide definition in relation to true care of patients. August 2017: What do we mean by ‘Dignity’. See Tiffany Dawson’s excellent ‘abundant life’ blog on this concept from CareNet website: https://www.care-net.org/abundant-life-blog/debunking-the-death-with-dignity-myth? UK – October 2017. Former lecturer with Motor Neurone Disease, Noel Conway, fails in his bid to be helped to commit suicide but intends to appeal the ruling. His case was supported by Humanists UK and opposed by the secretary of state for justice, Care Not Killing and Not Dead Yet UK, also made submissions.The British Medical Association has previously expressed its opposition to physician-assisted dying, saying it risked putting “vulnerable people at risk of harm” and would be “contrary to the ethics of clinical practice”. A male nurse, Neils Hogel, above, may have killed scores of patients in nursing homes in northern Germany. Nurse Högel was given a life sentence in 2015 after he confessed to the murders of about 30 people at two clinics. Even at the time police suspected that he was responsible for more deaths. Evidence for these has emerged now after they exhumed and examined 134 bodies. It appears that Högel had given a number of them a lethal injection. Although the total will never be known, as a number of patients were cremated, it appears that he killed at least 90. This makes him the worst serial killer in Germany’s criminal history. USA – September 2017: Are ‘brain dead. patients really dead? Bioethicists Michael Nair-Collins, of Florida State University College, and Frank Miller, of Weill Cornell Medical College, assert that patients who are brain dead may nevertheless be said to have retained the integrated functioning characteristic of human life. This is the case even when the patient is supposedly “dependent” on a ventilator. The corollary to this is that the ethical justification for organ procurement from brain dead patients is undercut. “The science underlying the claim that the ‘brain dead’ are biologically dead organisms is weak and fundamentally flawed. Since the accepted ethical rationale for vital organ procurement from ‘brain dead’ patients relies on the validity of the neurological standard for determining death, the accepted ethical rationale is undermined as well.”The authors suggest that “a new consensus” must be reached on the ethics of vital organ transplantation — “one which is not premised on demonstrably false claims about the vital status of biologically living patients”.The provocative paper echoes claims made elsewhere about the invalidity of current justifications of brain death. It will be interesting to see how the bioethics community reacts to the growing clamour against conventional accounts of organismal death. Astonishingly, the state-appointed lawyer defending little Charlie Gard’s best interests is chairman of Compassion in Dying, a sister organisation of Dignity in Dying whose aims it shares, denies a conflict of interests in representing a child whose right to be treated is being decided (Anger at choice of Charlie’s lawyer,Telegraph, July 17, 2017). Dignity in Dying used to be the Voluntary Euthanasia Society, formerly the Voluntary Euthanasia Legalisation Society, which in the 1930s saw euthanasia as a weapon against overpopulation and called for it to be applied to patients with diseases like tuberculosis; if they had succeeded, no cures would have been found. Dignity in Dying say they want to legalise the killing of people with severe problems, but by now it is abundantly clear that legalisation, even with a very narrow remit and hedged about with safeguards, establishes the precedent that for the sick and disabled and indeed anyone who is “tired of life” (as in Holland), death is in their best interests. No treatment is guaranteed to work, and if we insist on cast iron proof that it will, we may as well give up on medicine and just kill people. It’s certainly cheaper. Canadian euthanasia doctors are pressuring the provincial governments to pay them more money for euthanasia. Supposedly, some euthanasia doctors have stopped killing people based on money. 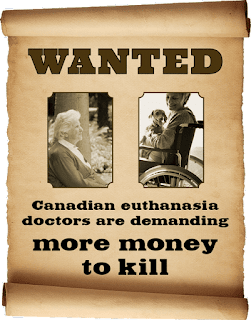 An article by Kelly Grant published in the Globe and Mail, appears to pressure governments to pay more for euthanasia. The article insinuates that access to euthanasia has been impeded by the money doctors make to do lethal injections:Dr. Pewarchuk, an internal medicine specialist in Victoria who has presided over 20 assisted deaths, took his name off the list of willing physicians last month after the body that sets doctors’ pay in British Columbia approved new fees that he and some of his fellow providers say are so low they could chase away even the most committed physician supporters of assisted dying.Maclean’s magazine published an article by Catherine McIntyre stating that physicians in the Netherlands are paid more money to kill:In the Netherlands, for example, where physician-assisted dying has been legal since 2002, providers are paid a flat rate of about 1,500 euros. That’s $2,200 Canadian dollars and at least five times more than what MAID providers can earn in Canada. On top of that, Dutch physicians are given a paid day off after assisting a death to take care of themselves emotionally. (Correction: Professor Theo Boer sent a message to the Euthanasia Prevention Coalition’s Executive Director, Alex Schadenberg, stating that Maclean’s magazine was wrong. According to Professor Boer, doctors in the Netherlands receive 227 euro per euthanasia). The Bishop’s letter also coincides with the release of new data showing that unborn babies with disabilities are being aborted at higher rates than in the past in Scotland. (Convened by the Pro-life Nurses Group).Venue: the Royal College of Nursing, 20 Cavendish Square, London. Keynote speakers: Dr Peter Saunders, Christian Medical Fellowship, Steve Fouch Head of Nursing, CMF and Paul Diamond, Standing Counsel for Christian Concern. This was a well-evaluated programme with top class speakers. The delegates were interested in knowing more about this fundamental aspect of nursing in line with the expectation of the Nursing and Midwifery Council. The dangers to the vulnerable today were explored well from Â the historical, pharmacological, legal, nursing and conscience perspectives. The role of the nurse as patient advocate, is recognised as vital for patient well-being and safety, Â particularly in a utilitarian age with cost- cutting preoccupying many care settings. Shift patterns, particularly 12 hour shifts, were discussed, and are known from research to be a source of nurse stress and can impact greatly on care continuity but can, and should, be re examined for their contribution to both nurse and patient best interests. The Mental Capacity Act and the former Liverpool Care Pathway were revisited. Concerns were raised that the former inappropriate LCP practices are continuing in some areas. Discussion was generated about the need for automatic use of syringe drivers in Palliative Care. Though a useful means of giving drugs, this route is not always to be considered inevitable where inappropriate/not required. The defence of ‘merely obeying orders’ was emphasised from an historical perspective – as there is no defence in law, for ‘merely following orders’ when patients are harmed (Germany, Nuremberg World War II trials). The toll, both physical and psychological, on the nurse, in attempting to maintain the role of patient advocate can be significant. Nurses need full support in managing this inherent responsibility with help from the profession, the managers and each other. The importance of Clinical Supervision cannot be underestimated. The Nurse’s Code of Conduct is a good means of ethical and legal protection for both the patient and the nurse. There was good interaction with personal experiences being shared which included those from the nurses, a former patient, a bereaved relative (LCP experience) and a hospital visitor. Simple comfort measures and extra time given by nurses, particularly at the end of life, were discussed. These do not always require expense and can relieve the possible feelings of isolation or distress, particularly when patients are placed in single rooms. New England Journal of Medicine, April 6, 2017: University of Pennsylvania bioethicists, Ronit Y. Stahl and Ezekiel J. Emanuel, have written a controversial article exploring Conscientious Objection laws which give health care professionals the legal right to refuse, on the basis of personal beliefs, to perform certain procedures or care for particular patients. The authors argue that professional societies should declare conscientious objection unethical and remove conscience clauses from their codes of ethics. This opinion has caused strong reaction among conservative bioethicists. According to the authors, objection to providing patient interventions…that the profession deems to be effective, ethical, and standard treatments…is unjustifiable. Stahl and Emanuel argue that doctors, in entering the medical profession, agree to abide by the ethical and professional standards of the profession: By entering a health care profession, the person assumes a professional obligation to place the well-being and rights of patients at the center of professional practice. We hope doctors and nurses will resist with all their might, together, as a strong body, this insidious, creeping culture which is as worrying as it is chilling. Belief in the right to exercise conscientious objection reflects the belief in universal human rights, the importance of recognizing conscience as fundamental to civilisation and ultimately the rights of vulnerable people. Catholic hospitals in Belgium which provide a substantial portion of psychiatric beds will permit euthanasia for non-terminally-ill patients. It is an unprecedented reversal of their stand on end-of-life care. Supporters of euthanasia, see this development as individual self-determination, which trumps long held Judeo- Christian prohibition. Such a development can only worry those who oppose euthanasia. Fifteen years after Belgium legalised euthanasia, most hospitals now provide this form of ‘care’. The overthrow of barriers which are an irresistible goal for the proponents of the culture of death has been achieved at the cost of Â true medicine and patient abuse. Many patients for euthanasia will be non- consenting as seen in those countries/states where euthanasia has been legalised. The religious founders of these care facilities are opposed to this decision, taken by lay people now involved in the day to day running of the hospitals. A Dutch doctor who held down a patient and euthanised her against her will did not break the law, a panel has ruled. A committee in the Netherlands concluded that the doctor had “acted in good faith”, even though the patient, who had dementia, struggled when the doctor tried to insert the intravenous drip. The committee decided the case should be brought to court to determine whether other doctors who euthanise dementia patients will be prosecuted. Andrea Williams, Chief Executive of Christian Concern, described the case as “a tragedy”. “This story is an example of the risks that the Netherlands liberal euthanasia laws are placing on the elderly, the sick and the vulnerable. “It should never be for a doctor to decide on a patient’s behalf whether that patient wishes to live or die. “Despite this tragedy, this doctor has not been charged. This sends the wrong message to Dutch society and indicates that others may carry out similar actions in future without facing prosecution. “The Netherlands is increasingly embracing a culture of death, when instead it should be promoting life and doing more to protect it. It is vital that we firmly resist any such policies being implemented in the UK. Medicine and nursing in the 21st Century ever seeks to increase the percentage of patients achieving a pain-free existence in the terminal phase of illness. Patients with end stage disease are a constant challenge to the vocational skills of their carers. In my experience, patients look to their carers to affirm their lives, not offer them death as a defeatist, cheap and easy option. No one of any age or degree of illness is granted a pain-free existence. To suffer is part of the human condition. We see practical love operating frequently in times of natural disaster, to make bearable the suffering of those having experienced loss, natural disasters, torture, persecution, injustice,or bereavement, in other words, in all forms of suffering, whether mental or physical. What makes suffering bearable is the constant, invaluable support by family and friends, and of course their carers in their loving concern,support, and practical care for pain, wounds and misery. No one should be unaware that rather than pain, ‘fear of being a burden’ underlies many people’s request for assisted dying, where it is legally-sanctioned. What an incredibly sad premise for this proposed law. Â The worst pain then, experienced by dying people is the fear of abandonment by their carers. Do we now compound this fear by offering the abolishment of the burden of suffering together with patientsâ€™ lives in the increasing numbers as seen in other European countries? Nurses will be the ones expected to fulfill the requirements of this Bill. I know many will refuse the implementation of such a dangerous and unnecessary law. Such a stand will no doubt lead to their persecution for a lack of so called ‘compassion’. The dangers of this Pathway spell out the overdue need for rational, evidence-based discussion among health professionals about its relevance to optimum patient care. The Government’s End of Life Care Strategy suggests that the definition of the beginning of end of life care is variable according to individual person and professional perspectives. For some, the start may be at the time of diagnosis of a condition which usually carries a poor prognosis. For others, it will be at a point when there is deterioration in a chronic illness and it becomes apparent that the likely prognosis is measured in months or possibly a year or two. Alternatively, it could be an elderly person who is becoming increasingly frail (End of Life Care Strategy 2008). Patients with increasing frailty or with a stable chronic illness, do not automatically become in the ‘dying’ phase, nor should they be considered eligible for a care pathway for dying patients. Misuse of terminal sedation involves the sedating of patients who are not terminally agitated, delusional or psychotic and have no clinical need to be sedated. Families have reported that patients often were eating, drinking, talking, even walking immediately before being sedated and all of a sudden became comatose. The issue of â€˜unfinished businessâ€™ is important to be addressed, and is a very relevant concept to many patients reaching the end of life and their families. The aim of those who care for dying patients, is not to speed them towards death. They are very well-placed as companions for the dying patient. Professionals hone their skills to acknowledge sensitively with patients, the inevitability of death. This allows professionals and patients to concentrate on improving the quality of their lives, to put their affairs in order and, wherever possible, to say goodbye before it is too late. There are two aspects here that give grave cause for concern in the headline and throughout this opinion piece. Â Firstly, giving drugs with the intention of ending life (that is, killing someone) is something that no nurse should do under any circumstances. Yet the headline suggests that some nurses might wish to do so, contrary to the criminal law and medical ethics which is a very serious matter. The second point of concern is the unquestioning use of the term “an intolerable life”. “Intolerable life” is one of the current buzz-words of the euthanasia lobby – it’s an idea that is used to attack the right to life of the weakest and most vulnerable people (who are often, but not always, those whose suffering is most intense). The idea that some lives are “intolerable” is used in discourse, in legal argument to justify making exceptions to the right to life. Just as terms such as “quality of life” or being a â€˜burden on societyâ€™ have been used to justify euthanasia in the past, the current effort is focussed on the notion of â€˜intolerabilityâ€™. The reason the assisted suicide/euthanasia lobby keep changing tack is that people realise that the main victims of any such weakening of the law will be the elderly, disabled, demented or dependent. It betrays a deep-rooted discriminatory attitude when people respond to an “intolerable life”, by asking about how to end the life, rather than how to make it more tolerable. The point that “there will always be another determined individual ready to fight all the way to the highest court” is interesting. Those people who take their cases to the courts are at the prompting of euthanasia campaigners, who want them to kill themselves (or be killed) rather than make a recovery. The cases are run by pro-euthanasia lawyers and (in the media) by the euthanasia society’s publicity machine. Of course individuals will keep pursuing this approach when the media and the legal authorities are happy to encourage them. The pro-death lobby has not suddenly emerged in the past few years: the anti-life humanist/atheist promotion of euthanasia has been around for many decades – or centuries. Sedating patients into unconsciousness and also deliberately depriving them of food and water will end life for that patient. â€œThe World Health Organization has demonstrated that access to pain-relieving drugs, along with a simple educational program, can achieve relief in the vast majority of patients. Specialists in various parts of the world estimate these basic approaches can control 85 to 98 percent of cases. The remaining cases require more careful attention and the use of multiple drugs and therapies to achieve complete relief.â€ Â These words were written in 1995. Professionals aim to move forward in the challenges of medicine and healthcare, including the problem of pain management. Many benefits for patients have been achieved over time by meeting such challenges which appeared insurmountable at the time. Dr. John Scott, â€œFEAR AND FALSE PROMISES: The Challenge of Pain in the Terminally Illâ€ in EUTHANASIA AND ASSISTED SUICIDE: The Current Debate , ed. Ian Gentles (Toronto: Stoddart Books, 1995), p. 96. What do we really mean by ˜indignity and loss of control’? Baroness Young will be aware that Lord Falconer’s Commission on Assisted Suicide was supported by advocates of assisted suicide. Those who accept uncritically its findings and recommendations overlook this fundamental flaw of bias. To endorse such a Commission’s findings does a disservice to those patients in the Netherlands who, despite so called safeguards within the law, have been killed without their wish. Such a process does not provide dignity in death or more control as Baroness Young suggests would be derived from a change in UK law. Furthermore, these patients did not have to be assisted in their dying by strangers in a foreign country, but were killed by their own carers, in their own country and against their will. Therefore, I find it incomprehensible that Baroness Young asserts, that the Commission found no evidence to suggest that changing the law on assisted dying would have a negative impact on end-of-life care. In light of these points, proponents of assisted suicide do not encourage vulnerable groups to feel anything other than at great risk from a change in current UK law. It is now well- established that disabled people are extremely concerned about a possible change in the law. Despite it being a long-held expectation that carers are to be trusted, vulnerable groups fear that in the event of a change in the law on assisted suicide, safeguards, in no time, may be considered as barriers to be overcome, particularly in financially challenging times.